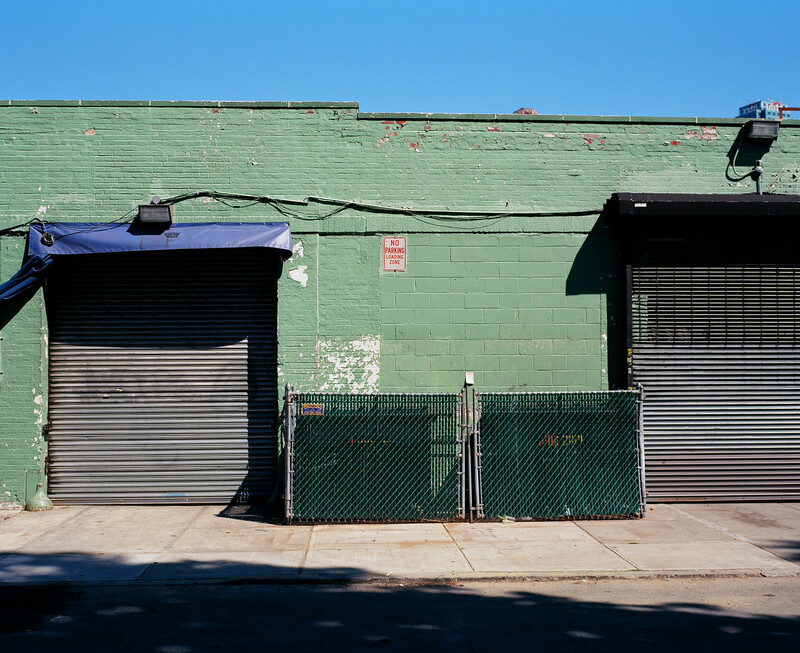 Earlier this week I noted that I was a bit wary of posting some of my shots taken with real film, because I sometimes end up falling in love with a shot that has a weak composition or subject, simply because I love the look of the medium. So here are two cases in point, which I think both fall into that category with a key difference. I think the image above is actually good. Not great, but a solid capture. It is enhanced by being a film image but has additional positive elements. 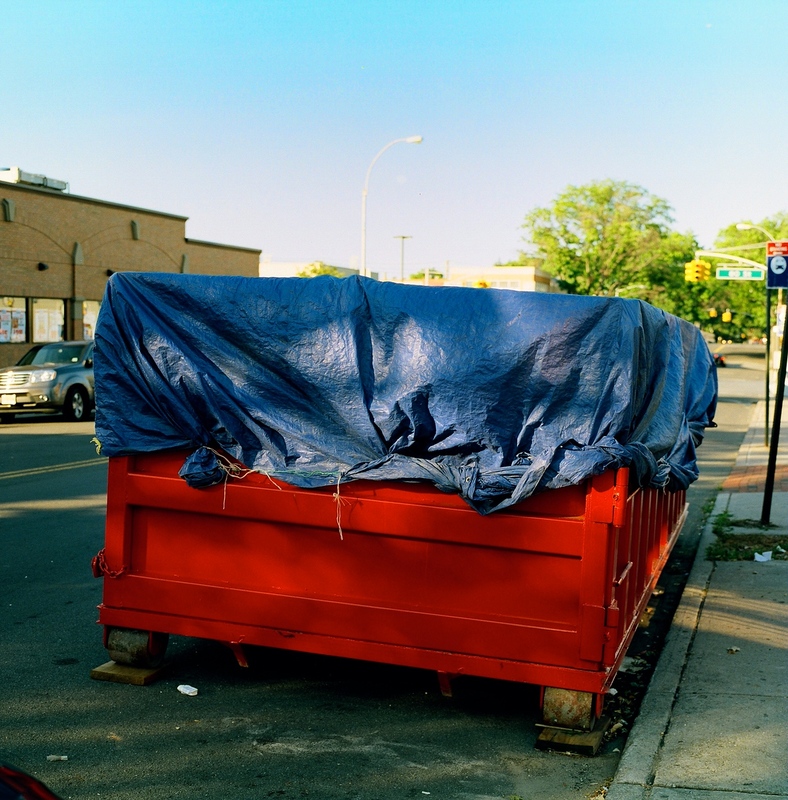 In contrast, the image below is one that would have never taken with a digital camera and that has very little to say for it except that I do really love the way that the red and blue of the dumpster look, and contrast with one another. The loser shot would hold no appeal for me in digital. No matter what processes or plugins I added, it would never look quite like this. But for all that, the image is nothing special — not because it is a photo of a dumpster, but because I don’t think the entirety of the composition adds up to much. The elements weren’t there. The top image, however, has something. The colors work again, but there is something more. I think the interrupted flatness of it works. That’s a lot of words that in the end add up to an excuse for me to post an image I know isn’t that good but which I can’t let go of. I really like that first shot – it does have great colours and that nice feel of film, but there is a lot more to it than that. It has a nice balance, the rectangles work well, there are good textures. It would probably work pretty really well in black and white too – it is an interesting photograph. Can’t ask for more than that. I have been regressing toward film lately, and find myself posting some pictures I might not bother with if they were digital because I too like the feel.